League of German Girls Proficiency Clasp - Bronze and Silver Class. 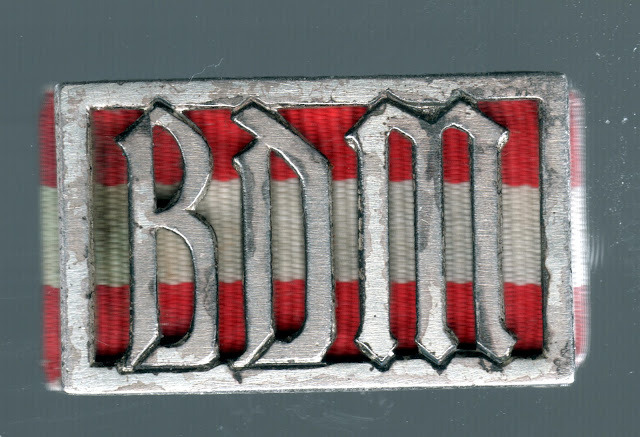 These awards comprise of an oblong clasp that measures 23.5 mm by 14.5 mm and is formed from a 1.5 mm outer metal line into which are set the Gothic capital letters, 'BdM'. Behind the clasp, stretched over a metal former, is a piece of ribbon that has three equal stripes of brick red, white, brick red. The length of the ribbon is 29 mm. The reverse shows two 4.5 mm bands that hold the front clasp to the back plate and hold the ends of the ribbon. On the plate can be found just the issue number for those badges produced before the introduction of the RZM office, the RZM logo M1/ and the manufacturer's number, or the grade A, B or C. The overall colour of the clasp is either bronze or silver. 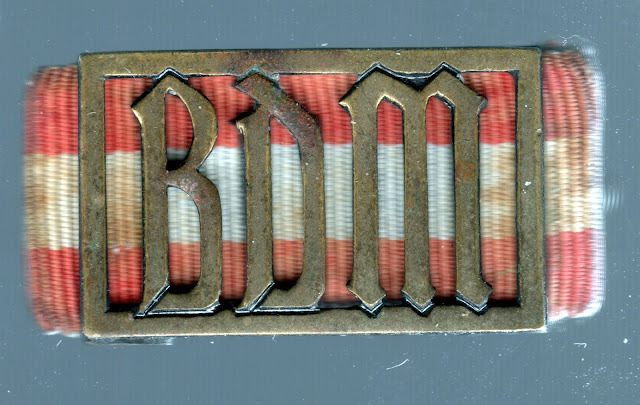 Reichsjugendführer Balder von Schirach as a proficiency clasp introduced these badges on 28th April 1934 for members of the Bund Deutscher M„del, BDM, the League of German Girls. 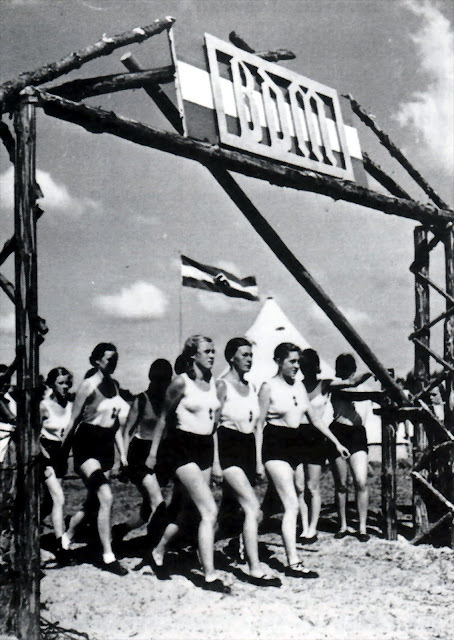 This was founded in 1930 as the female counterpart of the Hitler Youth. 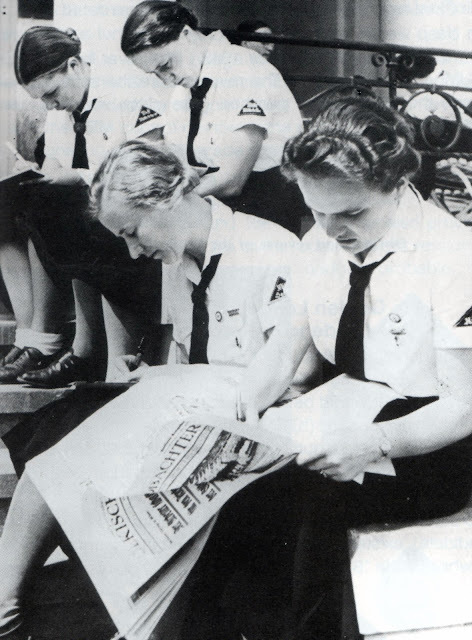 Service in the BDM after Hitler's accession to power in 1933 was obligatory for all girls between the ages of fourteen and twenty-one. Each class was subdivided into three to recognise the degree of proficiency attained in the test. The Bronze and Silver Classes were based on the recipient's age. The clasp was worn on the left breast of the BDM uniform. An estimated 115000 awards in bronze were presented. However, the figure for silver awards is unknown, but this could be less than 1000. The girls are students at the BDM equivalent of the Reichsführerschule. The two girls in the foreground wear the BDM Proficiency badge on their left breast pocket. The importance of the League of German Girls Proficiency Clasp, crowning the enterance gate to the Camp. Yes, this is correct. My mother wrote about receiving her Proficiency Clasp while in Landjahr Lager Seidorf. My upcoming book, "Through Innocent Eyes," will be released shortly. Please view my blog site and Landjahr Lager Seidorf. Thank you.